Robert Musumeci and Deborah Schembri. 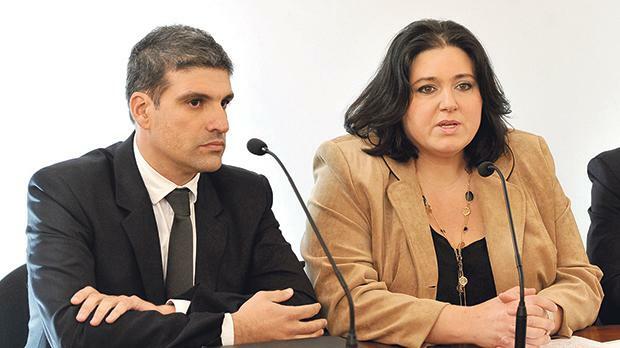 Former Labour parliamentary secretary Deborah Schembri and her advisor at her ministry, Robert Musumeci, have formed a new partnership to provide legal services to their clients which include government authorities. RD Legal, acronym for Robert and Deborah, was officially registered as a partnership, last year, according to the Companies Act. Their partnership, registered at Mr Musumeci’s architectural office in Siġġiewi, aims, among others, to act as advisors on administrative and technical matters in the field of property administration, procurement and contractual obligations. The two partners are also to act as representatives and to appear on behalf of customers as required. Times of Malta is informed that one of their partnership’s most important clients so far is the government. Both Dr Schembri and Dr Musumeci were appointed consultants to the Lands Authority and represent the public institution in court. A Lands Authority source told this newspaper that both former politicians are currently defending the authority in front of the Lands Arbitration Board and in other litigations in court. “They both have a good legal background on the workings of the new Lands Authority Act as basically this was their main focus when Dr Schembri was parliamentary secretary until she failed to be elected in the last general elections,” the source said. Dr Schembri was appointed a parliamentary secretary responsible for the reform at the then Lands Department in 2016 following the sacking of then parliamentary secretary (now minister) Michael Falzon due to the Gaffarena debacle involving public property in Valletta. Soon after her appointment, Dr Schembri appointed Dr Musumeci, who is both an architect and a lawyer, as her main advisor to steer the reform. Despite the fact that Dr Musumeci, a former PN politician who switched to Labour after the 2013 elections, had defended Dr Falzon during the Gaffarena scandal, declaring that he had done nothing wrong, Dr Schembri defended her choice to appoint him as her advisor. At the time, Dr Musumuci was already acting as an advisor to the Office of the Prime Minster, particularly with regard to the Planning Authority. During her short stint in office, Dr Schembri faced criticism after it emerged that Dr Musumeci, her consultant on lands reform, was also acting as her personal architect on a planning permit to build a new house next door to the residence of the Prime Minister in Burmarrad. At the time, Dr Schembri had denied any conflict of interest, saying that she was paying Dr Musumeci for his private services out of her own pocket. Both Dr Schembri and Dr Musumeci have been appointed to various government positions over the past few years. Since June 2017, when she was not returned to Parliament, Dr Schembri has landed four government jobs, raking in close to €200,000 a year from government consultancies and appointments, which include services to the Lands Authority and Planning Authority, the Office of the Prime Minister and Identity Malta. Dr Musumeci, one of the architects most successful at acquiring Outside Development Zone permits for his clients from the Planning Authority, was also recently in the news in connection with illegal works carried out by Transport Malta on an access road leading to his secluded farmhouse in Wied Qirda, limits of Siġġiewi. Mr Musumeci denied any connection to the illegal works, saying he had nothing to do with them. Despite an enforcement order to remove the illegalities nothing has been done so far.